Eden Mill is an award-winning distillery & brewery based in St. Andrews. Eden Mill required a new website, one which balanced between brand discovery, production and product purchase. 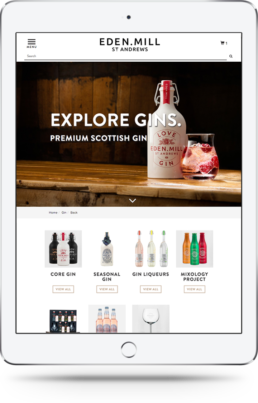 With a diverse range of customers, and product ranges, delivering an interactive visual experience of the products and distillery tours was important to their brand. For this design I worked closely with Eden Mill and their own branding/ packaging company. We discussed variations on ideas and solutions at the conceptual wire-frame stage, before commencing to design and build. 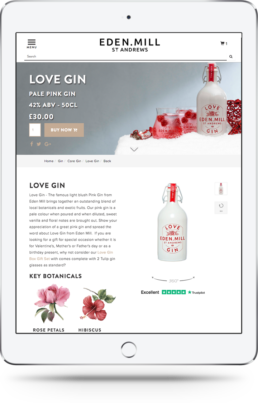 Within a couple of months of launch Eden Mills e-commerce revenue was over 235% and their Trust-Pilot score moved from 'Good' to 'Excellent'. A number of customers reviewed that the new site was easier to use and extremely visually pleasing. 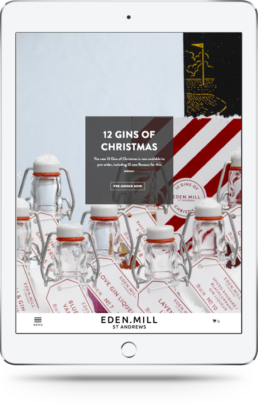 In late 2017 Eden Mill’s website was short-listed for ‘Best Digital Website’ at the The Drum Creative Awards, and won the 'Silver Award' in the W3 Awards for website design.